Merely a day after "Titanic" survivors arrived in port in New York City, a United States Senate committee began an investigation into the wreck of the great "unsinkable" ship. For the first time in book form, here is the dramatic testimony of crew and passengers from all walks of life, as they recall the sights and sounds of the night of April 14, 1912. From the manners of the day to the conduct fo those boarding the lifeboats, from acts of kindness to palpable greed, here is an unforgettable portrait of human nature in the face of the "Titanic" tragedy, in the words of the men and women who survived....J. Bruce Ismay, British officer of the White Star Line, who hopped into a lifeboat to save himself and never looked back to see her go down....Second officer Charles Lightoller's harrowing plunge as the sinking ship's force of suction pulled him under water....On-duty lookout Frederick Fleet's admission that the iceberg might have been avoided if the crew had been equipped with binoculars....Passenger Daisy Minahan, who recalled the refusal of an officer in her lifeboat to aid those adrift in the frigid waters...and many more witnesses to one of the most shattering events of our century. 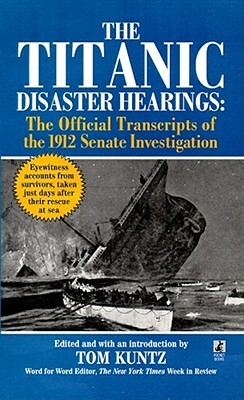 Illustrated with historical photographs, The "Titanic Disaster Hearings" is a vital piece of the puzzle that has sparked worldwide fascination.